I received two adult and one child's ticket (and one locker pass!) 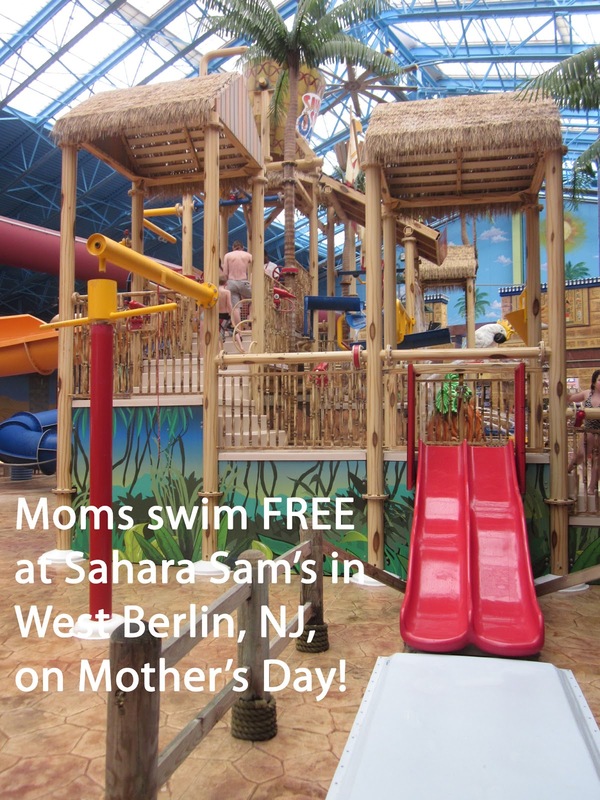 to splish and splash around at Sahara Sam's Indoor & Outdoor Water Park. I did not receive any monetary compensation. As always, my opinions are honest and my own. It used to be that if you lived in South Jersey or even the Philadelphia area you'd have to travel to far away major amusement parks, down the shore or up to the Poconos to cool off. Not any more! Save yourself the hassle of driving in massive traffic while saving on gas and head to Sahara Sam's instead. This indoor & outdoor water park, located at 535 North Route 73, West Berlin, NJ, is just minutes from South Jersey's busiest towns and only about 30 minutes from Philly. And it's open year round so even if this snow is falling you can take the kids to enjoy some swimsuit time. When we walked into the water park the first thing we noticed was the steamy "weather." It was perfect when we shed our winter clothes and sported our swimsuits. One of the first things that my two-and-a-half year old son ran up to was the Tim-Buk-Tu Adventure Playland. It's the centerpiece of the attraction with vibrant colors and water shooting out all over the place! Many parts of it are interactive giving the kids a chance to douse their friends with water. And watch out from above! Once the big splash bucket fills up it spills out and soaks everyone in it's path! Make sure you get on the attached water slides. I thought they looked a bit small at first but I went on the yellow one and had fun! They are quick! My son was in love with these fountains. We had to drag him away! Next up - The Lizard Lagoon, a perfect area for toddlers. My son was quick to go down the slide with a smile on his face and run through this little sprinkler. There was small swings to sit in and the entire pool was a nice place for little ones to splash around. I thought the area was a bit small and could have had a few more attractions but I was thrilled that there was even a place for kids that small. And besides, when their new outdoor water attractions open which includes SplishSplash they'll be more for them to do! Looking for a little chance to relax we grabbed a tube and floated down CongoBongo, Sahara Sam's version of a lazy river. At every turn there was a water fall or streams of water in your path, perfect on a hot day. I got drenched! One of my favorite attractions was Snake Eyes. This is for bigger Sahara Sam goers. My toddler was too small to go on this even with an adult so my husband, Nick, and I took turns going on it. We both agreed it was the most fun of the day. These slides are the colorful enclosed slides that you see outside of the building when driving by on Route 73. They are filled with twists and turns in mostly darkness and slide you along quickly! Zoom! You are at the bottom in no time. It was a ton of fun. A word of warning though - you have to climb a fairly high stair case to get the top of the slide and you will be carrying a tube. This didn't bother me any but it might me a little tough for those with health issues. Keep this in mind before you trek up the stairs. You may want to consider going on one of the most unique attractions at the place The FlowRider, an indoor surfing simulator. We did not try out this attraction because my son is too small to go on it and I didn't feel I had the talent to do! If you check out let me know how it was. I have to admit it was tempting. Keep in mind you have to 8 years of age and sign a waiver. There were a lot of accommodations including rest rooms, showers, and changing rooms. The place was immaculate. Every where we went from the attractions to the restrooms and the changing rooms were completely clean and well kept. They had plenty of things besides the indoor water rides to entertain guests including a full arcade and Samazon Ropes Adventure (open May-September). Even more fun is on the way with their new outdoor water park with volleyball court opening soon. Check out these new outdoor attractions to open in May 2013. Life vests are provided free of charge. There is a First-Aid station. There are clean, specious lockers. You can't bring your own food because it's prohibited by NJ State law according to the Sahara Sam's website. Your bags will be checked at the door. Food is available for purchase but truth be told I thought it was pretty pricey. We paid $20 for 3 hot dogs and two bottled beverages. Check out the menu. The good news is you can leave, have your meal and come back. They will also be opening a restaurant when they debut their new outdoor attractions this season so they'll be more options. In the winter and early spring consider using lockers closest to the snack bar rather than the First Aid station where it's a little breezy and chilly. Consider purchasing an annual pass for only $59.95. It's good for an entire year from the date of purchase and includes unlimited visits to the indoor and upcoming outdoor water park. It pays for itself in two visits! Bring suntan lotion during the spring and summer months because they have a retractable roof. For savings and offers visit the Sahara Sam's homepage and scroll to the bottom to enter your name, email and zip code. You'll receive emails from time to time with discounts. Connect with Sahara Sam's on Facebook and Twitter! And don't forget to check out their Virtual Tour to get an even better idea of how cool it is there!. Great review! My son has been hinting he REALLY wants to go here. Maybe Mother's Day is a great time to check it out. Thanks Denise! Great review! I have been wanting to try Sahara Sam's out for awhile now. Mothers day will be the perfect day to go!! I keep seeing this place and I'm REALLY thinking we're going to have to take a trip. It looks great! This is wonderful. I was speaking with my husband about going to a water park this summer; and this one looks like a great one to try. Sounds like a nie new place to start hanging out with the kids. Looks like so much fun. We have only done one water park before and my boys loved it. Great to take care of those winter blues or rainy spring days. I can't believe that we've never been to Sahara Sam's. It looks like such a great time! We definitely need to make it here! Looks like you had a great time!